We had three types of clothing: school clothes (clean, buttoned, presentable), play clothes (stained, torn, patched), and church clothes (all the pretty dresses). Church clothes were the most sacred because looking adorable was the way we fooled the little old ladies into thinking we were wonderful children. Alanna Rusnak is an author, editor, and publisher, and is still connected to the very same church where she's now employed as their online manager and graphic designer specialist (she made those titles up herself!—her actual job title is Creative Communications). With three publications under her belt and one on the way, Alanna dreams of a life where writing is her only career obligation. 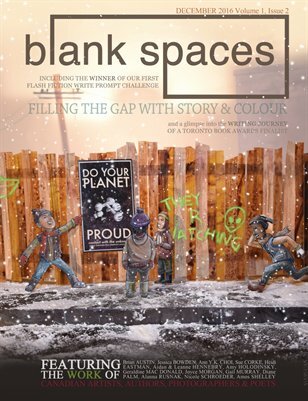 Volume 1, Issue 2 of Blank Spaces is a celebration of Canadian talent, featuring the work of artists—writers, painters, photographers, poets, etc. Awesome, Thanks for contributing your important time to post such an interesting & useful collection of knowledgeable resources that are always of great need to everyone. I visit this blog first time and encourage by this good stuff work. Unbelievable post keeps up posting such great information. There are things here that I didn't think some time as of late. am very enjoyed for this weblog. It’s an informative subject matter. Essay writing service reviews will help you to write best essays.